When I was a young girl growing up here in Phoenix, Arizona, I remember on Saturdays my dad and I would sneak out, while the others had to take naps, and head for the old Christown shopping center at 19th ave and Bethany Home rd. As we approached the center, I remember the Bob's Big Boy statue out in front of their restaurant, and knew that we weren't far from our destination. Finally, we would park and go into the Miracle Mile deli and split a brisket of beef sandwich on a Kaiser roll, with 2 dill pickles, and then head down the mall to the old Guggy's restaurant for dessert. Of course, dessert was always a delicious slice of that wonderful Pink Champagne cake. From then on, that became my special birthday cake flavor, and my mother would order one for me every year. As the years passed and became lost in time, I vaguely remember a newspaper article with the story of Guggy's closing it's restaurants. I was about 25 years old then, and although my birthday cakes were fewer and farther between, I was saddened to hear of such a special place filled with so many memories closing it's doors forever. My cake shop, the Victorian Cake Company, hadn't even been thought about at that time, and that part of my life was simply filed away in the back of my mind. Years later, when I had the opportunity to share my love for cake making and decorating by opening my own cake shop, one of my priorities was to try to reproduce (as closely as possible) the Guggy's Pink Champagne cake. I wanted those who remembered how good they were, along with the generations to come, to be able to enjoy something just as wonderful. After almost 2 years of trying, testing, and tasting we came up with our Pink Champagne cake that was inspired by the beloved Guggy's restaurant. 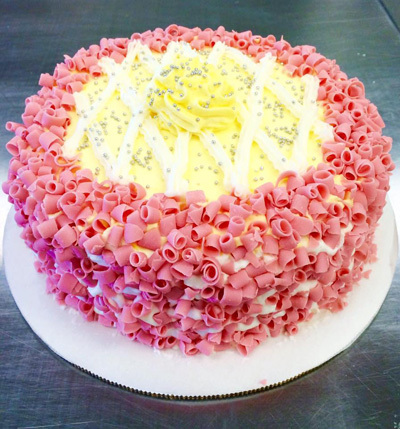 The "old-timers" here in town have said our Pink Champagne cake "takes them back in time" and "brings back memories from long ago". That was my goal, and today, with the Victorian Cake Company serving the Valley since 1989, I am very proud to carry on the tradition and be known as the "Home of the Pink Champagne Cake".